Home / Business & Investment News / Are Low Crude Oil Prices a “Boom Or A Curse” For The World Economy? The energy markets are tanking and are at levels that have not been seen since “The Recession” of 2009. Opinions are divided on the effects of the fall. Some say it is good for consumers, whereas, others say it is bad for the global economy. This article will analyze the overall effects of low crude oil prices on the industry, the major oil-producing nations, consumers and the overall global economy. The severity of the fall can be seen in the chart below. A glance at the charts of the top 10 crude oil producers shows the clear shift from Saudi Arabia to the US, as the largest energy producer in the world. An analysis of the top producers of oil gives us a clear picture of the effects of this fall on the global economy. Does the drop in price have far-reaching effects, which may lead to geopolitical tensions in the world? Is the power to decide the pricing shifting from the hands of the OPEC nations, for the first time in decades? Are the low prices laying a base for a much larger uptrend in the future? 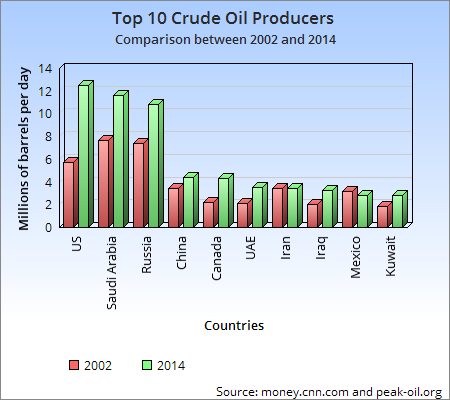 The US is both the largest producer, as well as the largest user of crude oil, in the world. Domestic supply caters to 50% of the daily needs, and the other 50% is imported, from around the world. The production from the US Shale wells have increased rapidly, in the last few years, and the industries associated with shale oil are being crushed. The boom in oil prices, and an improvement in fracking technology, has led to a rapid growth in the number of shale oil wells. However, according to various reports, most of the shale oil wells are profitable only when priced above $60/barrel. Some of these companies have taken large loans, in order, to expand their production, and with prices remaining low, these loans are likely to become unserviceable. A failure of the companies with heavy loans is likely to strain US Banks, which have loaned the monies to said companies. Along with the crude oil producers, the associate industries ie: the equipment suppliers, the hotel industry, the truck companies, etc. are also struggling, due to a decline in prices. With many drillers cutting costs, unemployment within this sector is on the rise, and wages are either stagnant or being reduced. New investments are being postponed. Associate companies, which supply to the oil producers, are slowly going “out of business”. As the US economy is very diverse, the overall impact is not alarming, however, US States that are dependent on the shale oil drilling, will almost certainly take a hit. Auto and airline industries are welcoming the drop in prices. Consumers, also have more disposable income to spend for their holiday shopping this year, due to lower gas prices at the pumps. According to Goldman Sachs, US households have around $150 billion to spend this year, due to the fall in crude oil prices. If the price remains low, the domestic consumer will become the beneficiary! The FED is struggling to increase the inflation figures to around 2%, but with low energy prices, fears of deflation are ever increasing. Russia is another major exporter of crude oil in the global economy. The high price of crude oil during 2009-2014, assisted them in recovering from the crisis. However, with oil prices ‘tanking’, the Russian economy is now struggling. According to bbc.com, oil and gas contribute 70% of the export income for Russia. Every dollar drop in the price of crude oil impacts the Russian economy by $2 billion worth of losses. With the Russian economy struggling, due to low crude oil prices and Western sanctions, it raised its interest rates to 17% this year, in order to stem the run on the Ruble. Refer to: chart of the Russian interest rate as shown. If the oil prices continue to stay low, Russia will struggle with its federal budget, since it mainly depends on the profits of crude oil. Some believe that President Putin is likely to resort to actions which will divert the attention from his struggling economy, and thus create geopolitical tensions in the world wide. OPEC consists of twelve countries that produce 40% of the world’s crude oil demand. Saudi Arabia has been the leader of the OPEC nations and its change in production has significantly impacted the price of crude oil. For the first time in years, it looks like Saudi Arabia is losing its status as the decision maker of crude oil prices in the world. 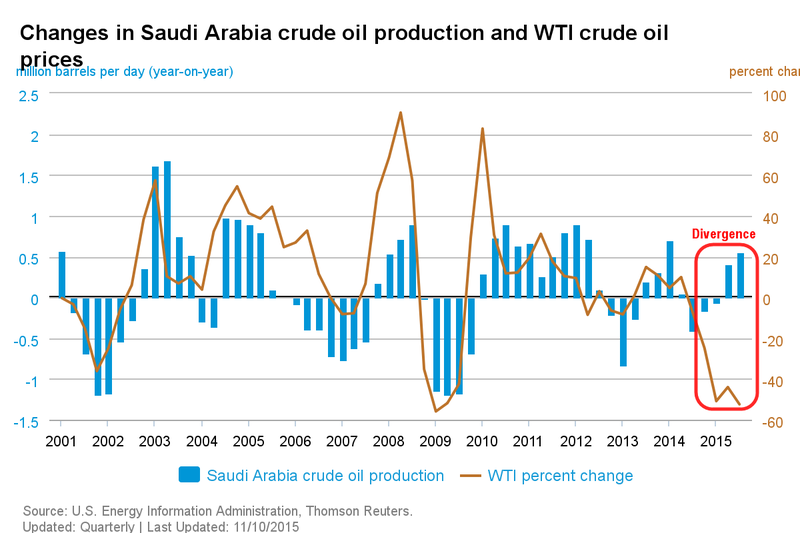 The divergence in price and the increase in production of crude oil, by Saudi Arabia in 2015 in the chart below is an indication of its declining power as price and their production have moved together in the past. The recently concluded meeting of OPEC, on December 4th, 2015, showed the divide among the OPEC nations. The smaller nations like Algeria, Venezuela and Ecuador are all reeling under the effects of low crude oil prices, and their efforts to force a ceiling on the total production was rejected. Though Saudi Arabia has strong foreign reserves, which can support its economy and aid in pumping oil at these low price rates over a long time, it too has begun to feel the pain. The Saudi stock market is down 27% from its high of this year. The international rating agency of Stand & Poor’s reduced the sovereign rating of Saudi Arabia by one notch in October 2015, with a negative outlook. Stand & Poor’s expects Saudi Arabia to have a budget deficit of 16% of its GDP, in 2015. There are unconfirmed reports of an internal power struggle of the throne, in the oil-rich nation. Any power struggle in the Kingdom of Saudi Arabia is likely to destabilize the entire Middle East region. The chart below clearly shows that the current price of crude oil is not favorable to most of the nations. Many are bleeding heavily, due to the lower oil price and are struggling to fund their budgets. It won’t be long before the chinks in the armor of the weaker nations will begin indicating whether prices remain low, for a long time. Oil importing countries like India, Japan, China, and some Western European countries have actually benefited from lower crude oil prices. China has been a major net importer of crude oil in recent years. With the Chinese economy slowing down, a fall in crude oil prices will help by increasing its foreign exchange reserves. However, only a fall in crude oil may not be sufficient enough to prop up the Chinese economy. For a few countries, like India, the fall in crude oil prices is good news, as it will help them control their current account deficit. However, the major ill effect of this fall has been the fears of deflation in Japan, Europe and the US. The ECB, the FED, and the BOJ are all struggling to bring inflation to around 2% so as to avoid deflation, but thus far they have failed. If prices remain low for a considerable period of time, it may lead to another crisis with deflation at the core. Saudi Arabia likely wants to keep the price down so the US Shale producers to go “out of business”. However, the US Shale production has been resilient so far. Russia is also at its highest output and Iran is expected to increase its output in the coming months and therefore, many oil-dependent countries are finding it difficult to handle their budgets. The strain among the countries taking opposing sides was evident during the recently completed OPEC meeting on December 4th, 2015. If price remains low for too long, it is sure to cause geopolitical tension, lead the economies of Europe, the US and Japan towards deflation. Oil producers will have to cut production, in the future, as the low price is unsustainable in the long-term. When this starts to occur crude oil price will find a bottom. I will keep you updated regarding the time to enter oil, for long-term gains in the future. But until then follow my analysis and forecast. GET 12 MONTHS OF TRADE ALERTS FOR PRICE OF 6! 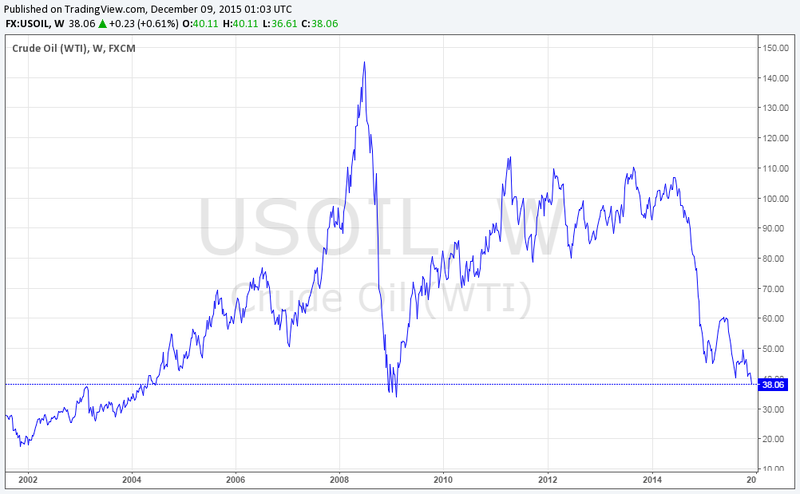 The post Are Low Crude Oil Prices a “Boom Or A Curse” For The World Economy? appeared first on Gold Forecast – Silver Forecast – ETF Trading Strategies – ETF Trading Newsletter.